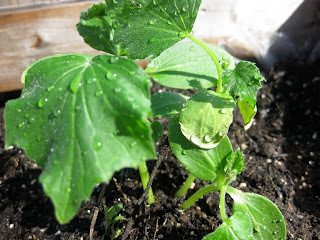 Planting can be easy, it's all the other stuff (like getting the plants to survive, for instance) that can be difficult. 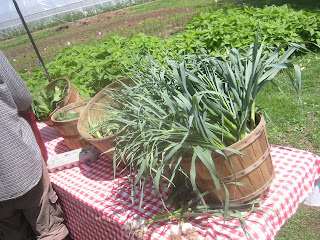 At my farm, we spend a lot of time weeding, hoeing, weeding, and did I mention weeding? Because we want to tread lightly, both in terms of soil compaction and in terms of air pollution, we try not to rely too much on our tractor, which means we do a lot of hand-work. On a 5-acre farm, that can be pretty demanding. With all the weeding and the physical labor, it's easy to forget what you're actually doing, and by that I mean growing food. Good food. There's a magic moment that happens when you harvest your first spring vegetables, after months of work, and you suddenly realize, "Oh! So THIS is what I've been doing!" And it tastes and feels delicious. There is really nothing like it. Knowing that you can feed yourself and feed others through the work of your body feels very sweet. This week we harvested our first zucchini- bright yellow and deep green- and they were baby-sized and perfect, some still holding onto their bright orange flowers from which they had emerged. I can remember that when we seeded them in the greenhouse, weeks ago, summer seemed so distant, like a vivid dream that gets blurry the second you open your eyes, but you know it happened. And now it's officially summer and those seeds are two-foot tall, lush, green plants with fruit hanging off of them. Waiting to be picked. 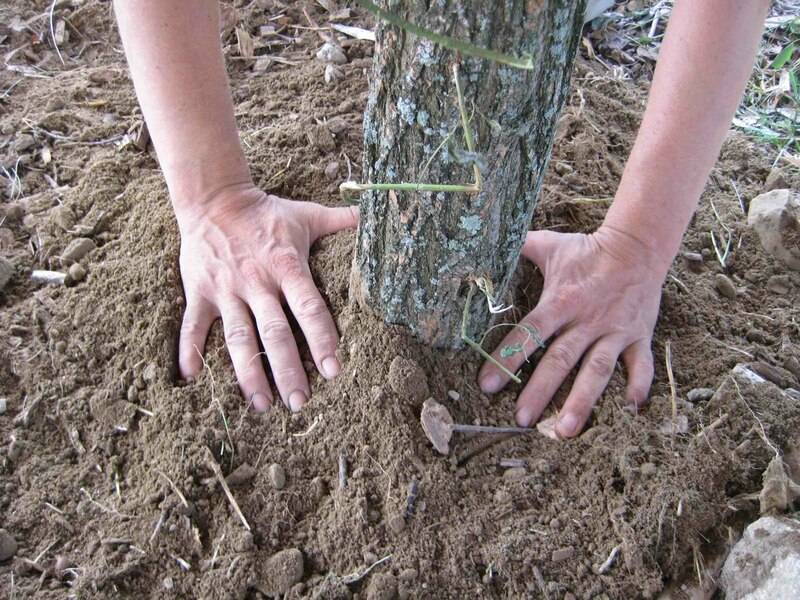 Today I planted a dead tree. A black locust, to be specific. I planted it with the rest of the farm staff here at Eden Village to be the central post in our farm zoola. What's a zoola, you may be wondering. Imagine a hot day on the farm, your morning spent harvesting summer squash, watering your seedlings, and laying out some new beds. The sun is shining down on your red neck, and the sweat is dripping off your nose. It's time for a break. So you head into our zoola, and kick it on the hammock for a bit. You sip some ice tea, and maybe play a game of shesh-besh (backgammon) before getting back to work. Our zoola is a chill spot, a place to get horizontal after a morning of being vertical in the hot sun. It's shaded, yet allows for vistas of our farm. 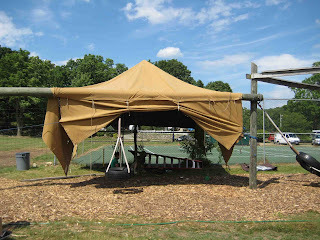 It's covered, but will also let a little rain in, to keep us honest. We still have some more setting up to do to make it complete. 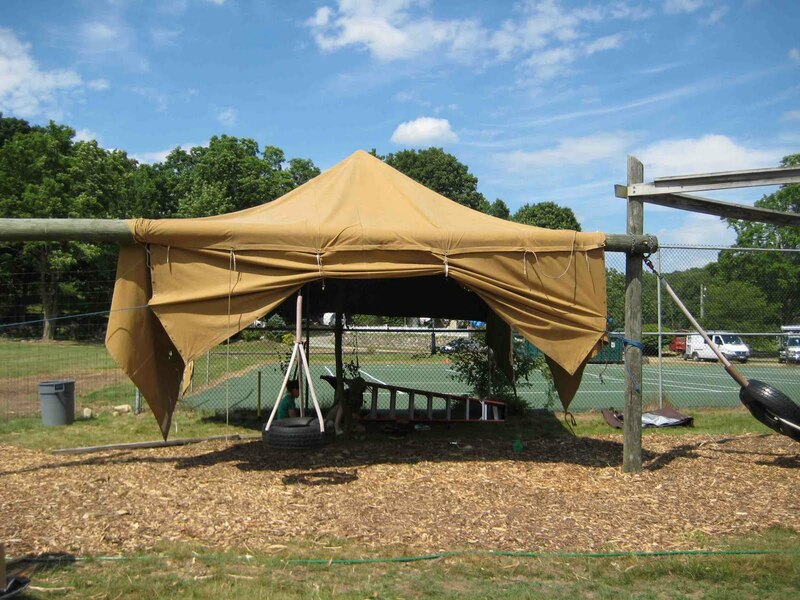 The campers arrive tomorrow, and we're all pretty sure they're going to dig it. Garlic is one of those plants it would never have occurred to me to attempt in a home garden. I have no idea why, it's so common, and I cook with it constantly, but regardless. We grow vast amounts of it here, literally thousands of plants, on a beautiful hillside, and we're just beginning our harvest. 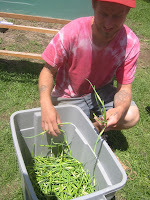 Over the past few weeks, we've started plucking off the scapes -- the curlicued green things with white tips that spring from the center of the greens -- both because it leads to a larger bulb, and because they are tasty by themselves. Plucking the scapes is also strangely satisfying. The pluck off easily, just grab it at the base with your fingers and twist, making a really satisfying snappy sound. 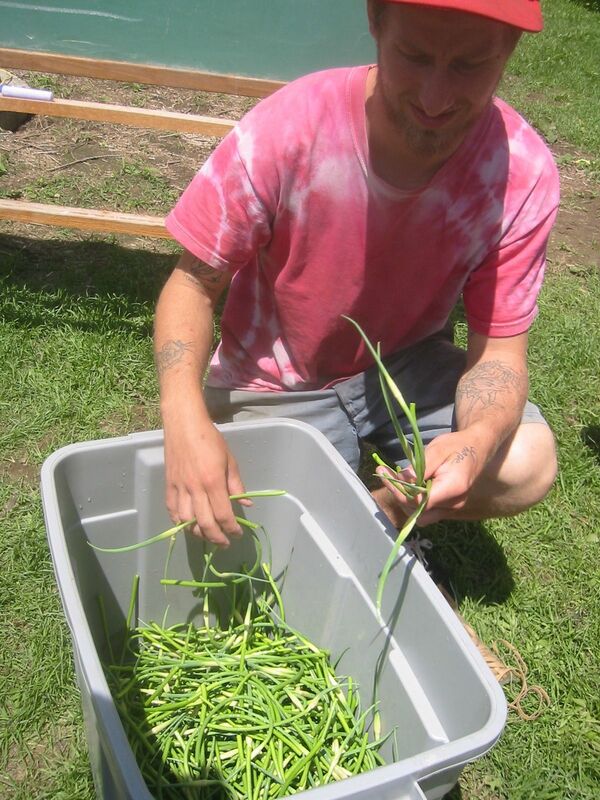 At right, my farming buddy Dave is preparing bunches of scapes to sell at the Manchester Farmer's Market. We use the scapes, and sometimes the greens too, in pesto. We also roast them with olive oil, salt and pepper. And we're beginning to harvest the whole plant, even though they're only single cloves at the moment. Tonight we're having curry with garlic cloves and greens, and a side of roasted scapes. Talk about leaving no trace. Well, I'll be darned if it's not the nicest thing to walk outside and pick a bunch of fresh-as-it-gets lettuce, spinach, and chard. A few tomatoes and cucumbers from the store, some delicious feta cheese, a little olive oil and balsamic vinegar and we had the perfect light dinner. It's just so great when you get to this time of the season - it's beyond "hey, that looks like grass" and deep into "hey, that looks like food!" Last winter I got a Hannukah present from my girlfriend's mom. It's a mug that says, "Sustainability. Grow it yourself. Plan a Farm Garden Now." At first we all kinda thought it was funny. What exactly is a "Farm Garden?" Why should we "Plan" it rather than "Plant" it? Our thinking was that this mug was most likely not produced by native English speakers, and something got lost in translation. But over time I've found it to be more accurate than I originally thought, as it, in many ways, describes the last few months of my life. 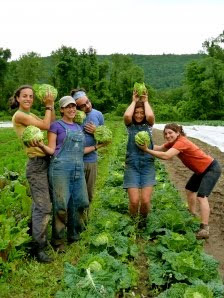 I have been planning a Farm Garden (I'm still not entirely sure what that is, but I'm getting a better idea everyday) for Eden Village Camp, a new camp opening next week in the Hudson Valley, NY. Much of this planning has been from a distance, and therefore, hasn't actually included a whole lot of planting. Until yesterday. The farm staff has been on site for a few months, but the rest of the summer staff, myself included, only arrived on Sunday. So yesterday, a handful of us went out to the Farm Garden and had a little planting blitz. We had several flats donated to us from a friend's farm, and the plants were itching to get in the ground. So along one of the paths of our Farm Garden, we planted okra, sunflowers, holy basil, marigolds and zinnias. In just 10 minutes, we got over 100 plants in ground. Right as we were planting, the intense heat started to break with some much needed rain. Perfect timing. All night the skies provided the watering and the plants adjusted to their new homes. It's gonna be a good summer. 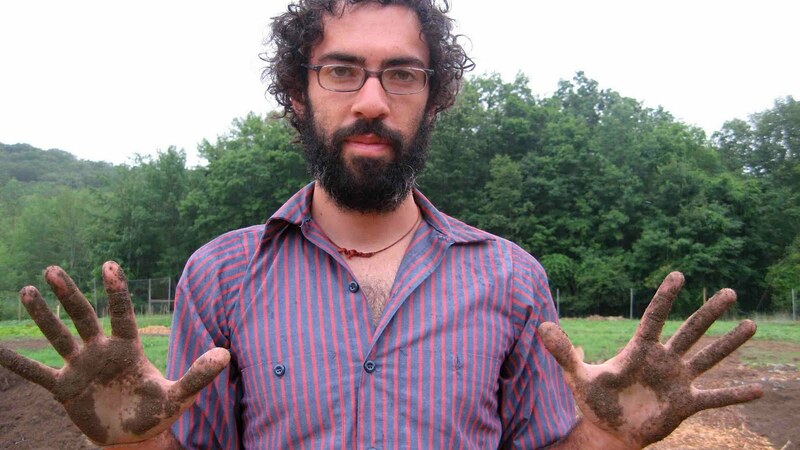 FYI, the bloke in the picture is not me...it's Jonah, one of our awesome farm interns. I am a city-slicking, apartment-dwelling, non-driving, bagel-eating, jay-walking New Yorker, born and raised, through and through. But it doesn't mean I don't like growing stuff, sniffing out those wayward shafts of sunlight that might nourish a green thing or two. I share an apartment in Bushwick with my sweetheart Sean (he's the one responsible for all the photos) and we decided to take the plunge and try our hands at a rooftop container garden this year. Last year we managed three bushy tomato plants and a small herb garden, so we figured it was worth a shot. That's right - it's the most simple piece of green to have around. 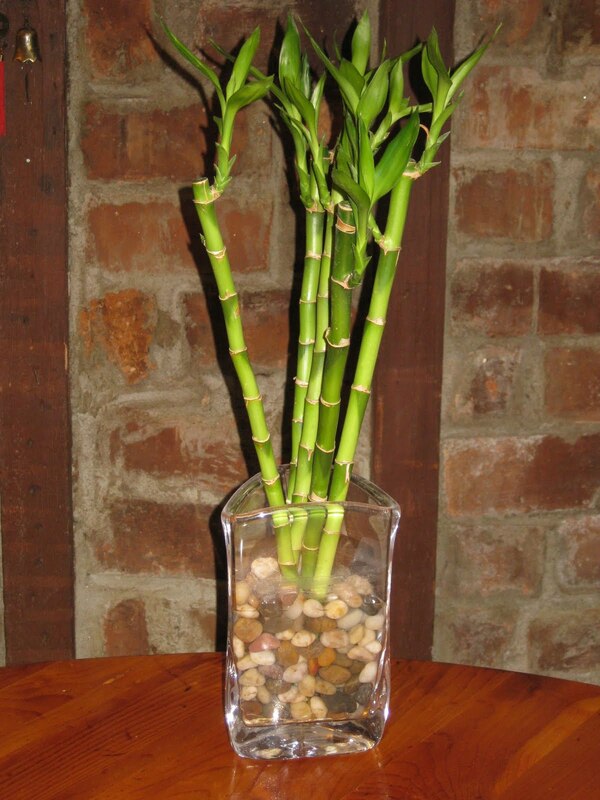 You'll see it called lucky bamboo, but as long as you give it water, feel free to call it whatever you want. Technically known as Dracaena Sanderiana, you'll see it in lots of asian stores, restaurants, and right up there on my bookshelf. It doesn't need much light, and you can keep it in any container that you can fit a few rocks in to hold it upright and about an inch or two of water. Things are coming along really well so far with my veggies. There's been some really hot days, where I've had to water more than usual, some rainy days that have let me take a couple days off, and some days that are absolutely perfect. The salad greens are coming up nicely and should be ready to eat in the next couple weeks. I'm going to throw down a bunch more seed - really saturate the soil with it, so they come up in a nice big tangle of fresh goodness. Family legend has it that the shamrock in my parents house is a descendant of a plant they had over 30 years ago. They gave a cutting to a friend, and, years later, after their original plant had passed on, got a cutting from the friend. This means that they've effectively had the same plant for a really, really long time! Over the number of years, I've gone through a bunch of versions of this plant. Some have been lost to neglect, some to bad treatment, and others to....other forms of neglect. Luckily, I always am able to take a cutting when I go home. I picked up the most recent one a few weeks ago, when I went home for a visit. It was a sickly looking plant, but my dad said he was pretty sure it would come back to life with lots of sunlight and constant wetness. I'm happy to say that in the last few days, some small sprouts have started to peek their heads above the soil, and it does indeed look like, at least for a short while, the family shamrock will live on. Here's a photo of it in it's current state. Those long tendrils are the old growth, and you see those bright green leaves starting to grow. Once there was an on- and off-ramp to the highway smack in the middle of San Francisco. Then, predictably, there was an earthquake that destroyed some of the on-ramp, and the 4 square blocks surrounding the ramps were gated in and left nearly isolated, save some drug addicts and prostitutes who inhabited it. After 20 years and failed plans to develop condos, the space was finally reclaimed as a temporary urban farm called Hayes Valley Farm. Last Friday, I was able to visit it as part of Chronicle Books' Volunteer Day. Like many urban farmers, the folks at Hayes Valley Farm aim to provide local, sustainable food and educate the community. The latter goal was exemplified by the long tour we got before digging dirt. Jay, our ever-enthusiastic guide, walked us through the process of creating roots for such a project. Highlights included finding a practical solution for saving trees choked in ivy. 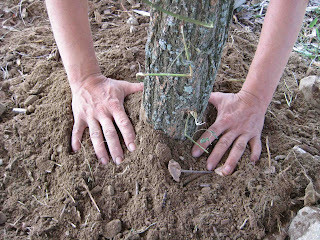 To salvage the trees, they turned to laying down cardboard at their bases, essentially suffocating the ivy, which would eventually break down with the cardboard, creating a nitrogen-rich soil. I was amazed at how cardboard was laid down in many places to kick start the farm, and while this certainly didn't make for a pretty sight, they'd figured out a way to re-use an item that would take resources to recycle. 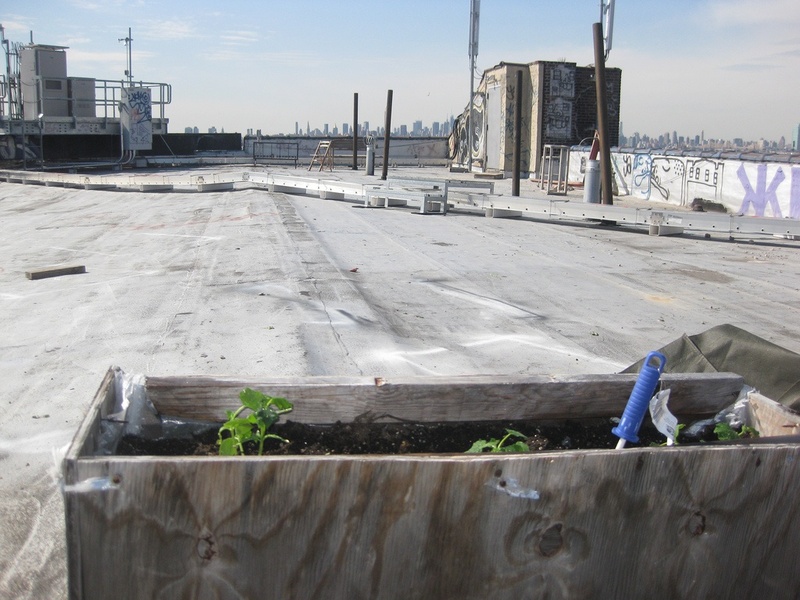 With 2.2 acres, the farmers also used dwarfed trees in pots to conserve space, and had rigged a potato planter out of some chicken wire, soil, and existing potatoes. Apparently, if you create a bed for about 20 potatoes and give it some good sun for 120 days, you'll get 4 times the amount of potatoes. I'm sure there's science behind this, but I'd still like to call it magic. After checking out their compost grounds and walking by some honeybees, we were put to work planting rows upon rows of fava beans. 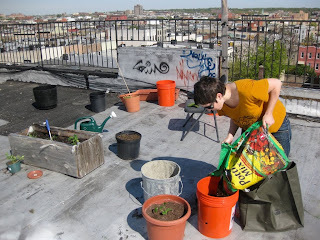 Interestingly enough, we were planting new fava beans because we were also cutting out old ones, tearing them apart, and throwing the remnants back onto the soil. Fava beans emit nitrogen-rich bulbs on the bottom of their roots, so we were creating life only to take it away and create more life. Nice touch, Hayes Valley Farm. 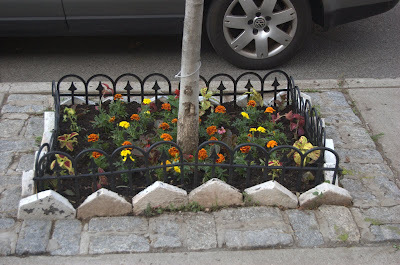 Beautify your street - easy, cheap and the neighbors love it! 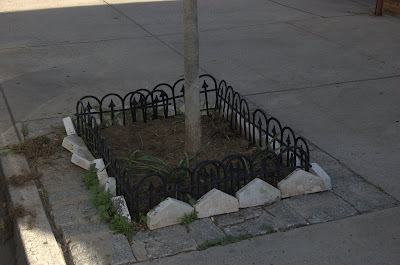 It had always bugged me that the little patch of dirt around the tree in front of our apartment seemed to attract all sorts of nastiness. It was an ashtray, doggy toilet, garbage can - just plain ugly, if you get my drift. I figured that I could add a little good soil that I had around after setting up my veggie garden, add a cheap little fence to it, and plant a few flowers. 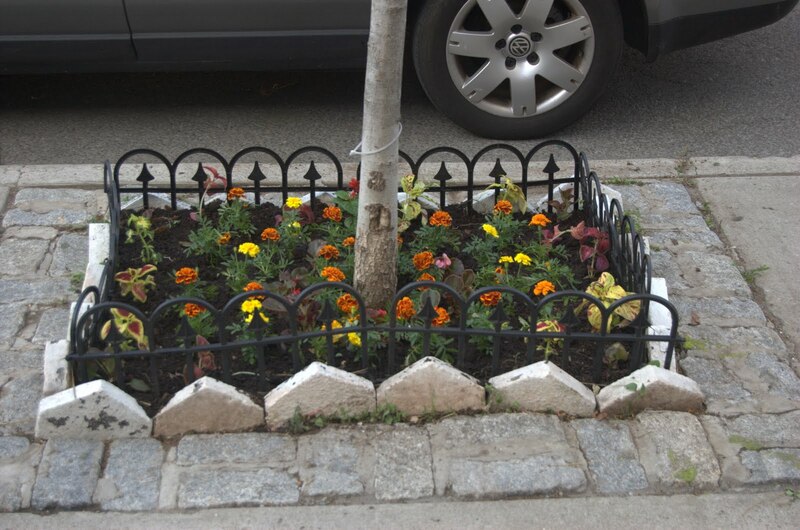 There's nothing like putting some flowers in the ground to stop people from dirty-ing up a couple square feet. Here's what it looked like after I dug it up and added some soil. Then, I hit up my local garden store and picked up a few flats of begonias for about $15 total - really not a bad price for a little loveliness every time I walk outside. So after no more than an hour and no more than $25, I had this nice little space. This was a couple weeks ago now, so it's started to grow in a good amount. Here's how it's looking today. You might think that your local farmer's market is a great source for fresh, local, delicious fruits and vegetables - and it is. 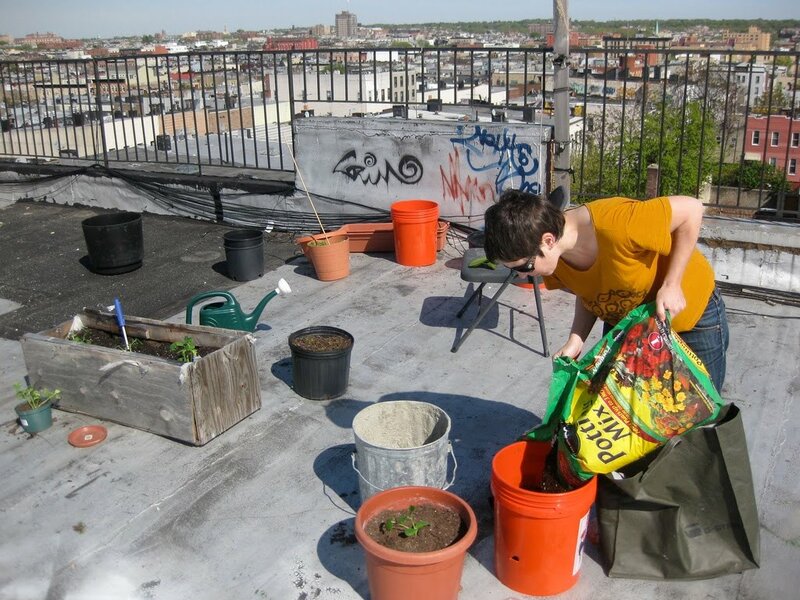 It's also a great place to start when you're thinking about doing some growing, whether flowers, veggies or other plants. The sellers tend be local, so they tend to be good sources of information about what, when and how to grow all kinds of things. If you have a pest problem, they've probably dealt with it before and can tell you how to take care of it. Got a question about when's the right time to get your seedlings outdoors without fearing the dreaded frost? They know. 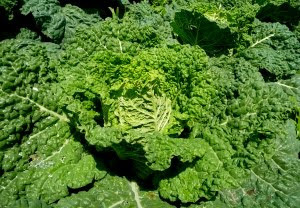 The farmer's market is also a good place to pick up already-started plants, such as peppers, tomatoes, herbs of all kinds, greens, and so on. 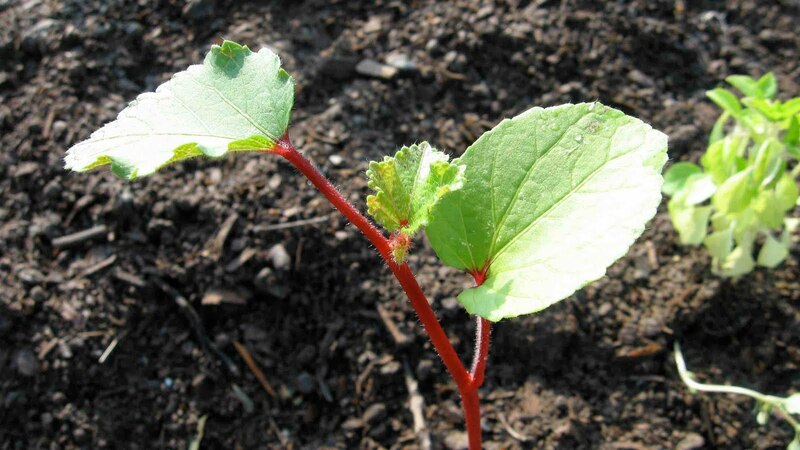 If you don't have the ability (or capability) to start them from seed indoors, being able to get some plants that you just need to pop in the ground is a big convenience. I tend to do this for my tomatoes, since my local market has many heirloom varieties that I don't see anywhere else. Flats of flowers of all kinds, houseplants, rosebushes, little trees for indoors and out - check out the farmer's market near you!